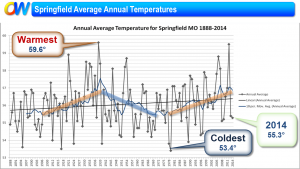 The preliminary temperature data for Springfield for last year is in and we were cold. 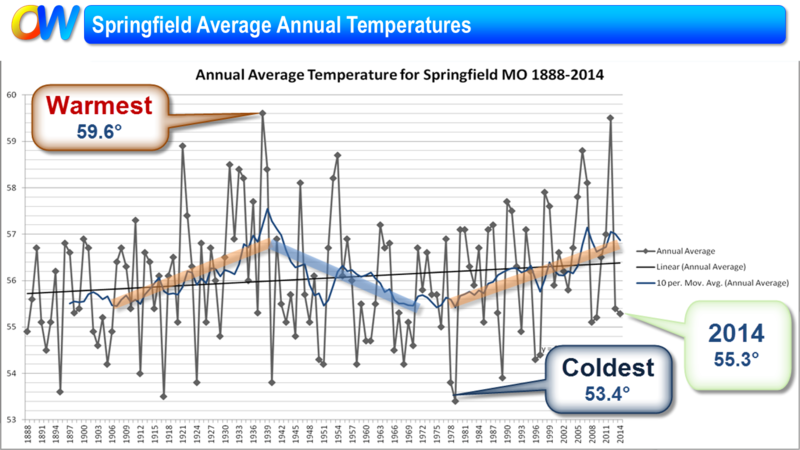 Out of 127 years of record keeping in Springfield, our average temperature was 55.3°, This works out to be the 40th coldest on record. The coldest year on record occurred in 1979 at 53.4°. The warmest year was 1938 at 59.6°. The graph above shows the annual average temperature for the past 127 years. Also indicated on the chart is the linear temperature trend and the 10 year running or moving average. It’s interesting to look at this annual data. While I put a linear fit line on the graph, one should note that the R-squared value is .02 which is awful for expressing anything meaningful for noisy and non-linear data such as this.